Ellen Datlow has released her longlist of Honorable Mentions for 2013, which includes work by Nina Allen, Stephen Bacon, Laird Barron, Elizabeth Bear, Georgina Bruce, Ramsey Campbell, Adam Nevill, Stephen King, John Llewellyn Probert, Steve J. Dines, Stephen Volk, Ilan Lerman, James Cooper, John Ajvide Lindqvist, Alison Littlewood, Livia Llewellyn, James Cooper, Carole Johnstone, Cate Gardner, Simon Bestwick, Gary Fry, Michael Kelly, Joel Lane…to name a few. “After Mary” Alt History 5. “Rag and Bone,” Tor.com April. “The Beatification of Thomas Small, Arcane II. “The Sunflower Seed Man,” Black Static #37. Thanks, as ever, to Ellen Datlow, and editors, Mark Lord, Nathan Shumate and Andy Cox. Arcane II has arrived in print! It contains my story, “The Beatification of Thomas Small”, and it’s published by Cold Fusion Media and the collection is edited by Nathan Shumate. After a recent technical hitch, their site is now up and running. Arcane II can be bought at Amazon UK and Amazon US. 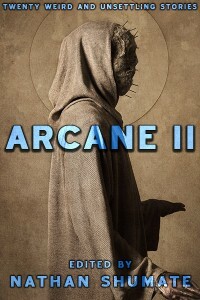 Arcane II, an anthology of horror, dark fantasy and weird fiction, edited by Nathan Shumate of Cold Fusion Media, is out on Monday 21st January 2013. It contains my story, “The Beatification of Thomas Small”. The ebook will be available on Amazon, Barnes & Noble, and Smashwords. The print book (which will follow in a couple of weeks) will be on CreateSpace and Amazon. The cover art is by a French artist, Nihil. It’s been a bit of a strange day. I’ve had two stories accepted. The first is called “The Beatification of Thomas Small” and it’s been taken for Arcane II, an anthology by Cold Fusion Media. The second is the story mentioned in my Next Big Thing post, “Rag and Bone”. It’s been taken by Ellen Datlow for Tor.com. Ilan Lerman was kind enough to cast an eye over it, so thanks to him for his feedback.